What filter type of robot vacuum is best for pets and allergies? What is the Best Type of Robot Vacuum Filter? When it comes to robot vacuum cleaners, many people focus too much on aspects of cleaning system, navigation, and Smart features. No one seems to be highlighting the importance of filters and that’s why we decided to bring you a fresh twist on why you should consider the filter when shopping for these floor cleaners. You will agree with me that, even when all your floors are clean, you may still remain with some bad odor. More so, if you keep pets, you understand that dander-related allergens are a real menace especially if you are allergic. 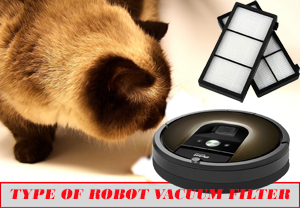 In this article, we are going to look at some of the filter technologies used by top robot vacuum cleaner brands but just before that, a little background information on the problem of allergy. Allergen filters – do they work? What’s the best filter system? There are several types of allergies, the common one being nasal allergies. The Asthma and Allergy Foundation of America reports that over 50 million Americans have nasal allergies so when they inhale allergens like dust mite, dust, and some select odors, the condition is triggered. Also notably, allergy is the 6th leading cause of chronic conditions in the US with 30% of adults and 40% of adults affected respectively. The worst thing is that the numbers keep rising. We all love pets as they are great companions at home and that’s why you will find them in 62% of American households. Most of these pets are cats and dogs and as we know, they often shed hairs which have these allergens. Please note that pet hair is not an allergen as most people put it, they only harbor the allergens. These allergens include dander, skin flakes, saliva, urine, pollen, mold spores and so on. When these allergens come into contact with your nasal membranes, the body tries to fight back and that’s when you experience symptoms of allergy-like sneezing, running nose, facial pain, hives and so on. Unfortunately, there is no cure for allergy; you will only get allergy management medication. So, the only way to stay safe is to keep off allergy triggers like cold, dust, pollen, e.t.c. The best way to prevent allergy is to ensure there are no allergens in the air and robot vacuum cleaners help a great deal in eradicating all these allergens from the air. They use filters that capture all the allergens leaving you with fresh, breathable air. All said and done, the elephant in the room remains, what’s the best filtration technology? That will be our concern today. We will review some of the top filter technologies used by the popular robot brands and see how they stack up against each other. If you have an allergy and you keep pets, this is an article you will want to read to the end. Filters can be categorized into 2 classifications; primary filters and secondary filters. To ensure efficiency, manufacturers are now using double filters each designed to accomplish a specific task. 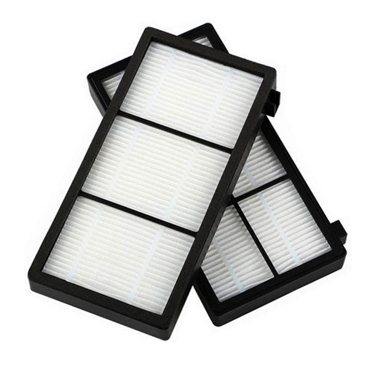 Typically, primary filters are for the large particles and dust and ensure that the dirt doesn’t go back to the floor. On the other hand, secondary filters are more detailed and are used to filter the smallest particles and allergens. In most vacuum cleaners for pets and allergies, you will find a dual filter system; one for solid dirt and the other one for filtering the air. Unlike navigation and cleaning orientation, there is no much development with regards to filtration technology. Since the inception of HEPA filters, there has been no necessity for trying something better because of their efficiency. This will be our next subtopic. Also read: How effective are Robot Vacuum Cleaning Systems? If you have a nasal allergy, this is the best filter system that you should have. HEPA may be perceived as a filter and also as a standard. It is the abbreviation of high-efficiency particulate air or high-efficiency particulate arrester. If you look at most advanced vacuum cleaners and even air filters, this is the filter they use. HEPA is also a standard in that it is a classification of filter types depending on their performance. I’m sure you’ve heard of HEPA standard filters. The problem now is that there are many filters out there labeled as HEPA but they don’t meet the specified HEPA standards. When shopping for vacuum cleaners, this is something that should stick in your mind; not just any HEPA offers real HEPA performance. As a matter of fact, there are two classifications of HEPA filters categorized depending on their true standards. 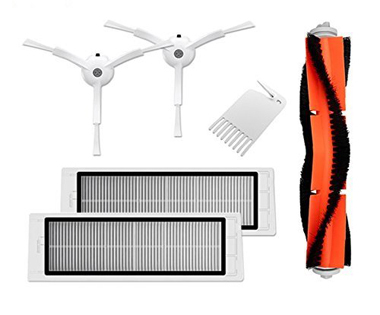 We have absolute HEPA filters and HEPA style filters. True HEPA filters meet the specified standards set by NIOSH (National Institute for Occupational Safety and Health). For a filter to be classified as HEPA, it must be able to capture 99.97% of allergens as small as 0.3 microns. Considering a human hair averages 50 – 150 microns, a HEPA filter will capture all the small allergens you might think of. But note that true HEPA filters are very expensive. One of the robot vacuums I know of with true HEPA filters is the Roomba 900 series (Roomba 960 and Roomba 980). On the other hand, HEPA-style filters, as the name suggests duplicates the entire HEPA technology but still, these filters are not as effective as true HEPA filters because of one reason or another. They may capture 80% – 90% of allergens and are commonly used in most cheap filters. The ECOVACS DEEBOT N79 has a HEPA style filter. I know you must be wondering, how will you tell an authentic HEPA filter from a HEPA-style filter? It’s very simple; authentic HEPA filters have a serial number and the test results embedded on them. The test results should be nothing short of 99.97%. Another thing that should raise the flag is the price; if it’s very cheap, it’s not true HEPA. If you have an allergy or you keep pets, always look out for a HEPA filter when shopping for robot vacuum cleaners for pet hair. Remember, while pet hair may not be an allergen by itself, it is a haven for the real allergies. Some of the robot vacuum models with HEPA filters include Roomba 800 series, 800 series, ECOVACS. Interestingly, we now have washable HEPA filters. During summer when dust seems to clog everything, a clean wash with water will rejuvenate the efficiency of your filter. At times, just washing the filter might save you a few bucks. You will realize that many top brands have HEPA filters, but this isn’t always the case. Popular robot vacuum cleaners like Roomba 650, Roomba 690, Botvac Connected D80 and several others lack HEPA filters. I know these two terms are very confusing and you are probably thinking what is what. I would say that they are both filter ratings, but their difference is their approach. MERV stands for Minimum Efficiency Reporting Value and the grading is based on the size of the particles a filter can comfortably handle. The ratings are from 1-16 and the higher the rating, the better the performance. On the other hand, HEPA stands for High-Efficiency Particulate Air and refers to filters that can filter 99.97% of allergens. That said, you will realize that in as much as they are two different things, they mean the same thing. It is just the same thing but in a different language. Typically, a HEPA filter will have a MERVE rating of 16 and above. This has been a common term especially with the growing need for allergens vacuuming. Now, you will find filters advertised as allergen filters meaning they have been designed to catch pet hair, dander, skin flakes and clear the bad odor of urine and poop. However, I find no much truth in this because there are no definite technologies that the manufacturers would back their filters with. The truth of the matter is that allergen filters are simply standard or HEPA style filters. They are only called allergen filters to assure customers that they are buying the right robot vacuum cleaner that will get rid of allergens. These are filters that are scented to at least alleviate bad odor. They come in a variety of scents depending on your taste. 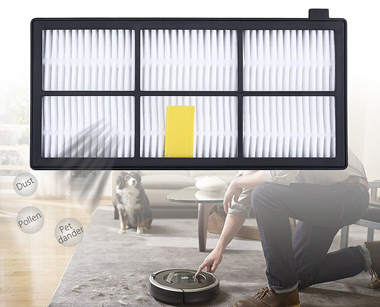 Unfortunately, these filters are not yet available for robot vacuum cleaners but in other regular vacuum cleaners, they are very common. I have used several before and even though the scent dies very fast, at least they can save you the embarrassment of a house with bad odor. If you keep pets or you have nasal allergy, it is imperative that you be precise on the filter system you will choose. HEPA filters remain the best choice as far as air filtration is concerned. This is the reason you will find it in most robot vacuum cleaners for pet hair and allergies. At times, you might have the best filter system but the problem of vacuum odor still persists. Here are some helpful tips that will greatly reduce the bad odor that emanates from the vacuum’s bag. In as much as you have a large bin, always empty it after every cleaning session. The buildup of pet hair, dander, skin flakes and other dirt leads to a foul smell. This is further worsened by moisture and the warmth of the bin. Even though it can be tedious to empty the bin after every clean, it is among the surest ways of ensuring there’s no bad odor in your house. It gets to a time when your filters get clogged because of excess dirt. But when removing the filters, remember assembling it back may be quite hard so you need to be very keen on the parts. If they are washable, the better. Use clean water and allow them to dry completely. One of the important things homeowners forget is ventilating their house well. In as much as there are vents, opening the windows when the vacuum cleaner is working may be helpful. Remember, these filters won’t be 100% effective so having some fresh air coming in will at least help drive out bad odor. The kind of filter you have greatly determines the quality of air you will get. When shopping for robot vacuum cleaners, it’s important you get a HEPA filter, regardless of whether you have pets or not, allergic or not – everyone wants fresh air. Just to emphasize, make sure you get authentic replacement every time. I’m sure you know the difference between true HEPA and HEPA-style. So, until next time, bye and don’t forget to subscribe to our blog for the latest robot vacuum deals and discounts! How Robot Vacuum Cleaners Navigate? Ecovacs Deebot N79s vs Eufy Robovac 11plus: Which is the best?